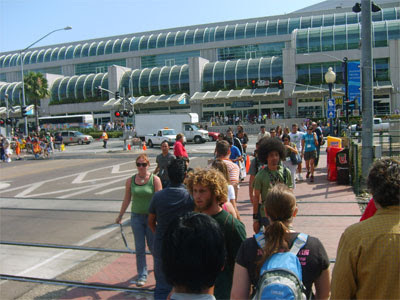 15 years ago I attended my first San Diego Comic Con. 6 years later, in 1998, EL MUERTO made his debut comic book appearance at that show. 2 years ago, back in 2005, we screened a rough teaser trailer for the EL MUERTO film, which had finished principal photography a few months earlier. 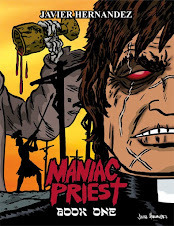 On friday evening, July 27, we screened the film to an audience of comic book readers, film buffs and a dedicated group of long-time El Muerto fans. In some ways, a circle was happily completed that evening. But not the last one, for sure. Here's the rundown of my friday in San Diego. Back when I first attended Comic Con in '92, attendence was at around 22,000!! (According to a post I found online by Jackie Estrada, long time Comic Con organizer) 22,000! That is hilarious! This past Con is rumored to be upwards of 125,000!! Wading through the mass of humanity outside the convention center, I would not doubt it for a second. Entering the actual building for me is always exciting. Because at this point in the game, you can usually find the same exhibitors in the same spot they usually occupy (back-issue comic dealers, booksellers, publishers) but then there's always a huge varitey of new people exhibiting, selling everything you could possible imagine related to comics and pop culture collectables. It's like finding the secret Ebay wharehouse or something. But of course one of the best things about going to Con is hooking up with so many of my friends, many who are selling their own comics but also plenty of 'civilians' I run into as well. One of the first booths I tracked down was that of good friends Rhode Montijo and Jamie Baker. They've been splitting a booth at Con for a couple of years now and often have some gimmick. 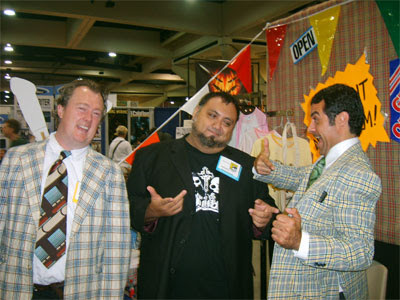 This year it was cheesy suits (think the classic used-car salesman) and signs all over the booth proclaiming 'Everything must go!" and "Prices slashed!". As I was standing around Rhode's booth, I notice that WWE wrestling superstar Stone Cold Steve Austin is walking around (promoting his new film I imagine). Actually, my girlfriend Bernyce noticed him and she went up and asked him for a photo. Using her as cover, I asked Steve for a photo as well. I wished him luck in his new movie careeer and he actually responded, in his trademark Texas gravelly voice, with genuine sincerity "Thanks, I'll need it!". That was very odd and charming to me. Here's Stone Cold, one of the most badass performers in the history of wrestling, and he's as scared and unsure as the rest of us entering the movie biz! Nice! Comic Con wouldn't be Comic Con without a visit to the booth of Rafael Navarro, the indestructable creator of Sonambulo. 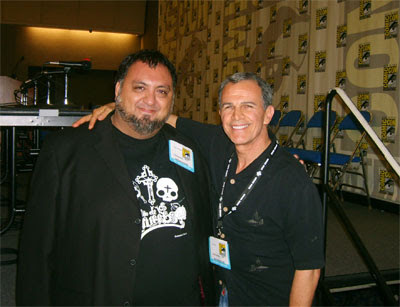 Here's me and Raf and his current director on a new SCOOBY DOO animated project, Kevin Altieri. Kevin is an animation director and long-time storyboard artist whose many credits include the classic BATMAN, THE ANIMATED SERIES! 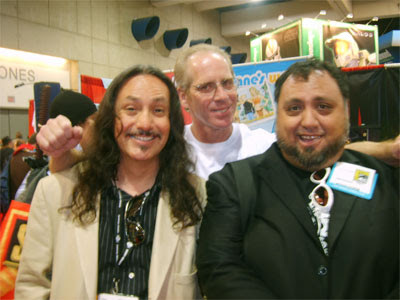 Dean LeCrone is a local San Diego cartoonist I met a few years back in the Small Press exhibitor area. 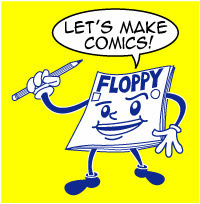 He does comics with a crazy bent of humor and Dean's also a good old fashioned 1970s-era comic book geek! My type of people! This year he was promoting his 'geeks gone crazy' DVD, "Dean LeCrone VS. The Mutants of Comic Con!"!! He filmed it at Con last year (I show up in bits of it I'm told!) and I hear from good sources it's hilarious! I actually forgot to pick up a copy but he's going to be screening it at an LA comic book shop in September, so I'll have to make that screening. Here Dean's checking my heart for Comic Con Excitability Syndrome....Because us comic book/indie film dudes have to take care of one another. 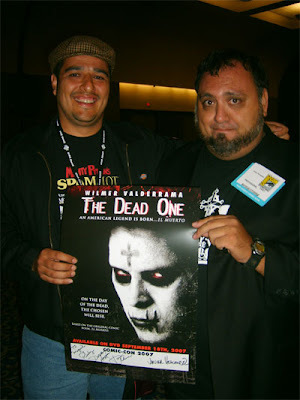 Speaking of excitability, the time was approaching for the EL MUERTO screening. But first, we had a dinner to attend. Who's 'we'? That would be me, my girlfriend Bernyce, one of our executive producers, Bruno Leone and his lovely wife Pat, my producer Larry Rattner, the Head of Sales for our DVD distributor Echo Bridge Home Entertainment, and one of the stars of our film, Tony Plana. Dinner was at a very nice and cozy restaurant called Busters, located near the Con. 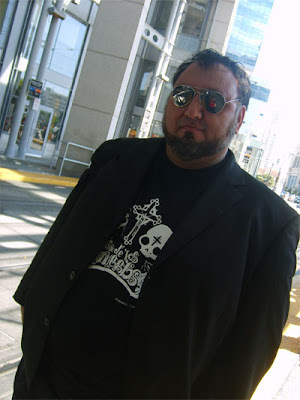 After getting my fill of Sangria, I was ready to head back to the convention center and show the film. The screening was scheduled for 9pm, but I had asked the staff if they could wait another 10 minutes or so. As the Con was closed at 7pm, I knew people would be making their way back from dinner, so the extra minutes actually helped. I had a good turnout of friends show up, as well as some long time El Muerto fans. But the majority of the people were just curios conventioneers looking for cool movie to see. I introduced the film and grabbed my seat, this time towards the back of the room. I was extremely exhausted after a very long day and I figured if I nodded off for a few seconds, no one would notice! (Imagine someone blogging about that the next day? '"El Muerto creator nods off at his own film"?!!). As usual whenever we screen the film to an audience that knows me, my cameo gets the expected cheer from the audience. That still pumps me up everytime I experience that! Immediately following the film we had a Q&A. Tony Plana walked up on the steps and I introduced him to the audience just as he set foot on the stage. As a long-time actor, and especially because of his current role on the multiple Emmy-nominated show UGLY BETTY, Tony's popular with the public. 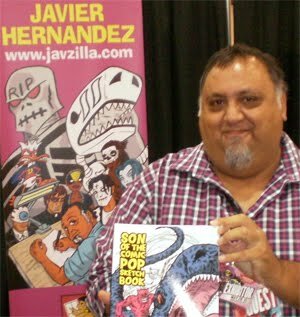 As I walked onstage I lifted the mike and lowered my voice "And Javier Hernandez", introducing myself to an enthusiastic audience (it pays to have friends and fans at these events!). Our producer Larry Rattner joined us and I moderated us through about a half hour of questions. The questions I get are always 'What was it like getting your comic made into a movie" and "When's the next book out?"! The answers are always 'Great' and 'Very soon'!! Moderating was actually fun, and I'm told I did a pretty good job. I don't know how often the creator of a comic book that's been made into a movie gets to moderate his own movie panel, but the wonderful thing about this entire film production has been that I've had the oppurtunity to be involved very closely with the entire process. We mentioned the release date for the DVD (Spet. 18) and I told the audience about the many features we've created for the DVD. Features such as a special Muerto mini-comic book I created to be packaged inside the DVD, a 'slideshow' of my first Muerto comic, a color gallery of El Muerto artwork by 7 artist I personally handpicked, a tutorial on how to draw El Muerto, a commentary track with myself and screenwriter/director Brian Cox, and interviews with the cast and crew. And I was very glad to see that they created a spanish language dub for the film, as opposed to just subtitling it. Before we ended the panel, I said something I had meant to say at the beginning of the screening. "I'd like to dedicate the screening to the memory of a comic book legend, Jack Kirby, the King of Comics". I met Jack at my first Comic Con back in 92, and he was always one of my two most important influences in my lifelong love of comics, so dedicating the film to him at this convention was an honor. We gave out this poster after the Q&A which Tony and I were more than happy to sign for the fans. Tony not only plays the wonderfully written Aparicio in our film, but he's such a generous person with his time. A real professional and class act. It was fun talking to the fans after the film. It was a manageable but enthusiastic crowd. Plus it gave me a chance to talk to some friends of mine who hadn't yet seen the film. Tony and I posed for several pictures and I can say that we all had a great time at the screening. I was always hoping to have had a chance to screen the movie at Comic Con and I'm grateful to the convention organizers for making it happen. Truly one of the highlights in an experience that is overflowing in highlights. 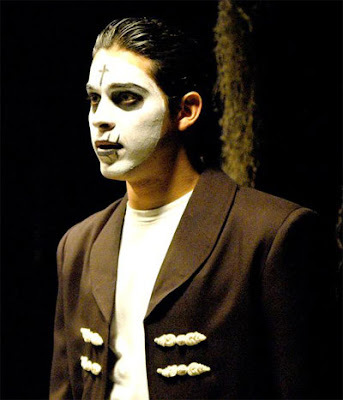 Next week we have a pair of bi-coastal El Muerto screenings! First up, in the city where superheroes were first created, New York, we'll be screening EL MUERTO at the New York Latino Film Festival on thursday, July 26 at 8:15 pm. Tickets are available. 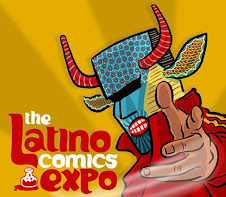 This is considered the premie Urban Latino film event in the country and it's a great honor to be selected to show here. And on friday night, July 27, we'll be screening EL MUERTO at the world's largest comic book/pop culture event, the San Diego Comic Con! The film screens at 9pm in room 6A. This is very exciting for me personally because as a 15 year attendee (and often exhibitor) of the convention I've seen my fair share of movie previews and comic book panels and now it's great to be able to finally show the film there! Scheduled to join me and producer Larry Rattner is star Tony Plana for the Q&A following the screeening. Two screenings back to back on both sides of the country. 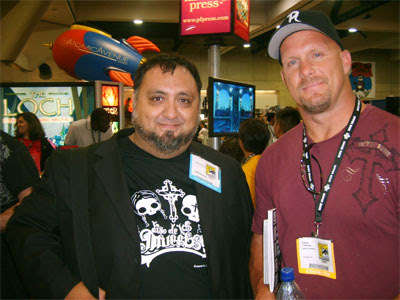 One a Latino film event the other a comic book convention. Either way you cut it, El Muerto has it's cross-over appeal! Hope you can make it to one of the screenings!